J.P. Moreland’s Love Your God with All Your Mind: The Role of Reason in the Life of the Soul is an outstanding book on the need for Christians to think rightly about God and engage our culture at a very high academic level. “Because the world we live in is full of influences that would shape the way we think—and consequently how we act and live—we need more rigorous discipline to be Christians and thinking people, not less” (16). 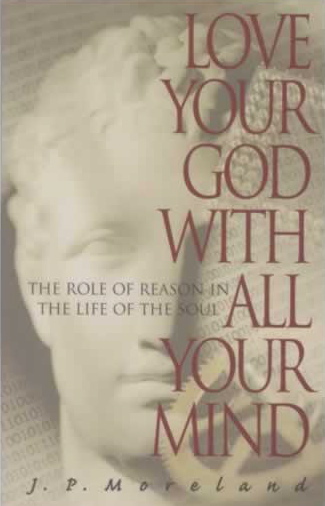 Moreland is convinced the Christian community has been infected with a sense of anti-intellectualism and has lost the battle for the Christian mind.1 Moreland argues for Christians to reason, think, act and live in a manner that is consistent with Christ’s command to “Love the Lord your God with all your heart and with all your soul and with all your mind” (Matt. 22:37, emphasis added). The book begins with short, excellent introductions by Dallas Willard and David Hazard. The book is divided into four parts. Part One: “Why The Mind Matters in Christianity” (Chs. 1-3) The title of chapter 1, “How We Lost the Christian Mind and Why We Must Recover it,” basically describes the contents of the chapter. Specifically, Moreland points to moments in Christian history when the church began a decline in intellectual reason. In chapter 2, Moreland provides biblical arguments for the value of reason. At the end of the chapter he combats five misconceptions that distort Scripture on the issue. In chapter 3, “The Mind’s Role in Spiritual Transformation,” Moreland describes his view of the soul and spirit. He explains five “states” of the soul (see p. 70), as well as of the mind and the spirit. Part Two: “How to Develop a Mature Christian Mind” (Chs. 4-5) “Harassing the Hobgoblins of the Christian Mind,” chapter 4, is primarily a discussion of what Moreland calls “the empty self.” “The empty self is constituted by a set of values, motives, and habits of thought, feeling, and behavior that perverts and eliminates the life of the mind and makes maturation in the way of Christ extremely difficult” (88). Chapter 5 is an encouragement toward “Five Groups of Virtues” accompanied by principles of reasoning and logic. Part Three: “What a Mature Christian Mind Looks Like” (Chs. 6-9) This section focuses on evangelism, apologetics, worship and vocation. Chapter 6 is titled “Evangelism and the Christian Mind,” although the majority of the chapter is about apologetics. “Apologetics is the primary form through which the Christian mind expresses itself in the task of evangelism” (131). Chapter 7, “Apologetic Reasoning and the Christian Mind,” deals with skepticism, scientism, and moral relativism. Chapter 8, “Worship, Fellowship, and the Christian Mind,” is about corporate and individual worship. Moreland also discusses the idea of friendship, or koinonia (“fellowship”), in community. In Chapter 9, “Vocation and the Integrated Christian Worldview,” Moreland urges Christians to think well in their vocations. If Christians are to make an impact on the world, then they need to be and live as Christians in the workplace. Part Four: “Guaranteeing a Future for the Christian Mind” (Ch. 10, Appendices 1-2) The final chapter is Moreland’s suggestion for reform in the local church, which he hopes will result in intellectual minds going out into the culture for the defense of the Gospel. The two appendices provide a very helpful list of resources (ministries, journals, magazines, and books) for further study. Love Your God With All Your Mind is an outstanding book in comparison to the incredible number of options available. It belongs in the top 5 percent of “well-written books.” Part 1 is the strongest of the 4. Moreland makes an excellent argument for why Christians need to be better thinkers and regain a sense of intellectual reason. That being said, this book has some serious gaps. Moreland’s discussion of the spirit, five states of the soul, and the mind’s role in transformation was unclear and disjointed. This topic could have been an entire book in itself. Later, Moreland offers a “Brief Lesson in Logic” (115-17). Entire lives, careers, and degree programs are spent studying the subject of logic, so a 2 ½ page “lesson” can be more confusing than helpful. It simply requires a much longer conversation to cover this topic. Moreland is critical of the “empty” Christian mind, and he is fair in that assessment. However, the entire culture is equally guilty of “dumbing down” the intellectual median. Moreland offers sound advice in regard to apologetics and evangelism. While a few people are asking well-thought questions, the culture at large is not. This is not to absolve Christians of their responsibility to think well and deeply. However, Christians may be preparing themselves for questions that most people aren’t asking or interested in engaging. One final critique is in regard to Moreland’s argument for doing away with senior pastors and replacing them with a plurality of elders. While his argument is well-founded biblically, it is difficult to argue that this is the primary means by which the local church should attempt to regain a sense of intellectual reasoning. Will churches changing their polity to an elder-led government really result in a strengthening of Christian intellectualism? Trevin Wax suggests that this book “deserves to be read by all evangelical Christians.” It would indeed push many “couch potato Christians” to “think carefully and deeply about what they believe and why they believe it” (20). The problem is that most evangelical Christians will not pick this book up because they do not care to think carefully and deeply. We have come to a place of intellectual stagnation and theological complacency that permits lazy thinking. The general mindset is: “God loves me. I prayed to receive Him in my heart. That’s good enough.” The selfishness of this mentality does not reflect the sacrifice of Christ described in Philippians 2. Furthermore, it communicates the idea that Christians do not care enough about non-Christians to share the good news of the Gospel with them. Love Your God with All Your Mind should be read by all evangelical pastors, teachers, and elders. While the aim is not to put more responsibility on them, our leaders must preach with an awareness of the need for intellectual acumen in the workplace. They must have a passion for knowing God and impart that passion in the minds of church members. Leadership is top-down. If leaders do not love God with all their minds, then neither will the congregation. When church leadership imparts vision, that vision should be taught and caught. Love Your God with All Your Mind is an outstanding book. Moreland provides a solid argument for why Christians must think well. The first few chapters of the book are outstanding and are certainly the highlight of the book! In the final chapter he brings some solid recommendations for local church reform. The two appendices are excellent resources and may well be worth the cost of the book. The book has some gaps and seems a bit disjointed in certain places, and Moreland makes several points that do not fit with the current of the book, but overall, this is an excellent resource. Read this book, and encourage your local church leaders to read it! Love God with all your mind! 1 In his book, The Scandal of the Evangelical Mind, historian Mark Noll makes a similar claim, arguing that “The scandal of the evangelical mind is that there is not much of an evangelical mind” (3).